I was at my local range this past sunday..and for a change it wasnt really crowded just a stead stream of people in and out....Most of the folks that go there are regulars and I see them every weekend....and since I'm the only guy that shoots bullseye I kinda stand out and everybody knows me and such....Well I had just finished a NMC course with the .45 and was returning my things to the range box so I can get out one of my .22's .So I cleared the weapon loaded the slide back and dropped the mag....Just as I turn around the fool next to me had loaded is gun at the table jacked one in the chamber and sweeps me with the muzzle with a HOT weapon.....I NICELY asked him not to load his gun at the table and explained that all actions are to stay open unless pointed down range and actually shooting....and I sTated I didnt like have a loaded weapon pointed at me and asked him not to do so again....well he didnt think I could hear him so he says to his wife/girlfreind " What a D--K .....I pretty much pretended not to hear him ....well I get all my stuff for the .22 and forgot to grab a couple of boxes of ammo so I turn around again just in time to see this idiot do the same damn thing.....this time I was far from nice after I pretty much ripped this guys behind I walked out of the range and demanded he be told to leave....which the range personal gladly asked him to do so. Theres something about a idiot with a loaded gun that really just pisses me off ...I really shouldnt have ripped him like I did but I was nice the first time......second time ....I was far from polite...very far. I am with you. I try and "educate" when I can but as Tater salad says "You can't fix stupid.". Paper, you did the right thing by having this POS removed from the range. Lets hope he never returns to your range, or any other range. He'll return. Worse yet, they breed. Why is it that "new" or even experienced but stupid shooters will not open the action when they set a gun on the bench? And almost always set it down so that it is pointing at everyone else who is shooting instead of down range! And don't even ask about empty chamber indicators. Some times the scariest place to be is on the firing line of a range where the general public can come and go BANG, BANG, BANG. I hate to start any sentence this way but "When I was a kid..."
My dad hammered gun safety into my head over and over. 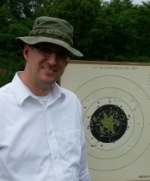 I had to demonstrate to him that I could safely handle the gun before I was ever allowed to put a shot down range. To this day, I find myself checking the chamber of a gun I just put back together after cleaning it to see if it is loaded. I love to see interest in firearms grow but the fact is that many people just want to throw lead and make a lot of noise. I remember one clown at the indoor range who was taking pictures of his girlfriend shooting, and he had her act like she was wiping her forehead with the back of her hand. She was holding the gun in her hand so she effectively swept the entire firing line with her gun. I ducked inside my firing booth (supposedly steel plated) and started yelling at the girl to keep her muzzle downrange. Someone at the front desk must have been watching the closed circuit TV and sent an RO to the firing line and politely asked them to leave. You did well. It's hard to keep your cool when someone points a gun at you. I was at a local gun store and another shopper pulled his Remington 1911 out of it's holster to show me how cool it looks, flipping and flopping it to show it to me from each angle, pointing the muzzle at all kinds of my and other people's body parts. I have loaded guns pointed at me so much at two of the ranges I frequent, that my dad and gf are convinced I will be shot one day. I try to educate anyone who will listen. Dewey, are you sure they are not just jealous husbands?